Our next TABE assessment is Tuesday, May 7. Call now to schedule your assessment time and get started on earning your high school diploma. 2019 Graduates. Our graduation ceremony if Friday, May 10. If you want to participate, we need you to come to our main Center and get fitted for a robe and pay for your tassel. We will order tassels next week. 2018-2019 GED Graduates GED Graduation is May 10, 2019 at 7pm. Please call the main center at 479-968-5244 for more information. No class Monday, January 21, 2019. Enjoy MLK Day!! We will see everyone back in class on Tuesday, January 22, 2019. GED classes will be closed for the Holiday break beginning December 21. Classes will resume Monday, January 7, 2019. Merry Christmas and Happy New Year to everyone!! No night class Thursday, December 6. Enjoy the Russellville Christmas Parade. Our next TABE test is Tuesday, November 27 at 8:00 am or 4:00 pm. Call now to schedule your test to start classes and let’s try to earn your High School Diploma before the Christmas Break. Students, tell your friends and family. It’s a great time of the year to earn YOUR High School Diploma. Happy Thanksgiving to everyone. We will not have GED classes next week. Classes will resume Monday, November, 26. Our next TABE test is scheduled for October 30 at 8:00 am or 4:00 pm. Call and make your appointment today to get started on earning your high school diploma. 479-968-5244. Adult Education classes will end at 6:30 tonight at our main center in Russellville. All other sites will have their same Thursday night schedule. Join us for an Open House at the new location of the River Valley Literacy Council, Tuesday October 23rd from 5:00-7:00 p.m. at 209 Cedar Street in Dardanelle! No classes Monday, September 3. Enjoy your Labor Day. We will see everyone Tuesday, September 4. GED testing September 5 & 6. We will not have classes August 6 - 9. Classes will resume Monday, August 13, 2018. Classes will be closed for two weeks beginning May 28, 2018 at the main center. Classes will resume June 11, 2018. Enjoy your break and we will be looking forward to seeing everyone back on June 11. This is another call to graduates who want to participate in the graduation ceremony May 4 at 7:00. Please give us a call at 968-5244. We will provide the cap and gown, you pay $10 for your tassel. We had over 100 graduates this year and would love for everyone to participate in graduation. Graduation is Friday, May 4 at 7:00 at Russellville High School's Center for the Arts. We need graduates there at 6:15. We also need graduates to come by the Adult Ed. Center by the end of next week and try on a gown and pay for their tassel. Tassles are $10. We will provide the cap and gown. Don't forget - No classes next week. Have a wonderful Spring Break. Classes will resume Monday, March 26. Next TABE test is Tuesday, March 6 at 8:00 am or 4:00 pm. Call now to make your appointment. Next TABE test is Tuesday, February 6. Call and make your appointment now. We will test at 8:00 am and 4:00 pm. Students: If RSD is out of school due to whether, Adult Ed is as well. So listen/watch school closings in the morning and if RSD is out - no class. Be safe and stay warm. No class Monday, January 15, 2018. We will see everyone on Tuesday, January 16. Next TABE test is January 9, 2018. Make your appointment now for 8:00 am or 4:00 pm. Start the new year off by earning your GED. Classes resume January 8, 2018. Happy New Year to everyone!! We'll see you next Monday. No class Thursday night - Russellville Christmas Parade starts at our building. We want to wish everyone a Happy Thanksgiving!! There will not be classes at the main center next week. Classes will resume November 27. Next TABE test is September 12, 2017, 8:00 am or 4:00 pm. Call now to schedule your test and begin classes. No classes MONDAY, September 4, 2017. GED Testing only for day classes tomorrow, August 31st. Night class will meet at normal time - 4:00-8:00. 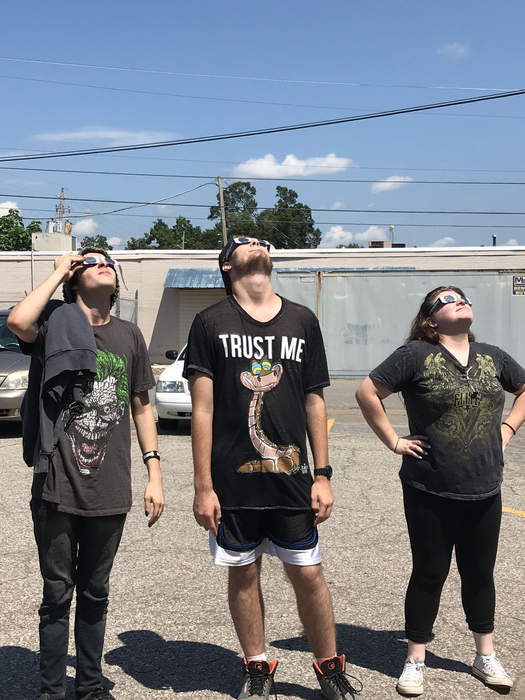 Adult Education students watching the 2017 Eclipse! Thank you RSD for the glasses! Students and Testers: Be careful traveling this morning. The roads will be dangerous. Take your time and get to school when you can. TABE test tomorrow, August 15 at 8:00 a.m. or 4 p.m. Come get started on your GED!!! Next TABE test in September. Why wait? Get started this week. Reminder: NO Classes next week! Start back on Monday, August 14. No Classes August 7 - August 11 for Teacher Training Week. Classes Resume Monday, August 14. WorkSource Job Fair Wednesday, Jan. 11 @ 10:00. Everyone is welcome. We are proud to announce our new Apps for iPhone and Android!